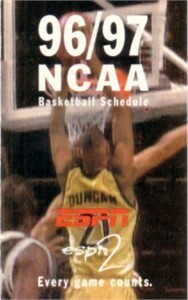 Original ESPN2 college basketball pocket schedule featuring Tim Duncan of Wake Forest on the front. MINT condition. ONLY ONE AVAILABLE FOR SALE.